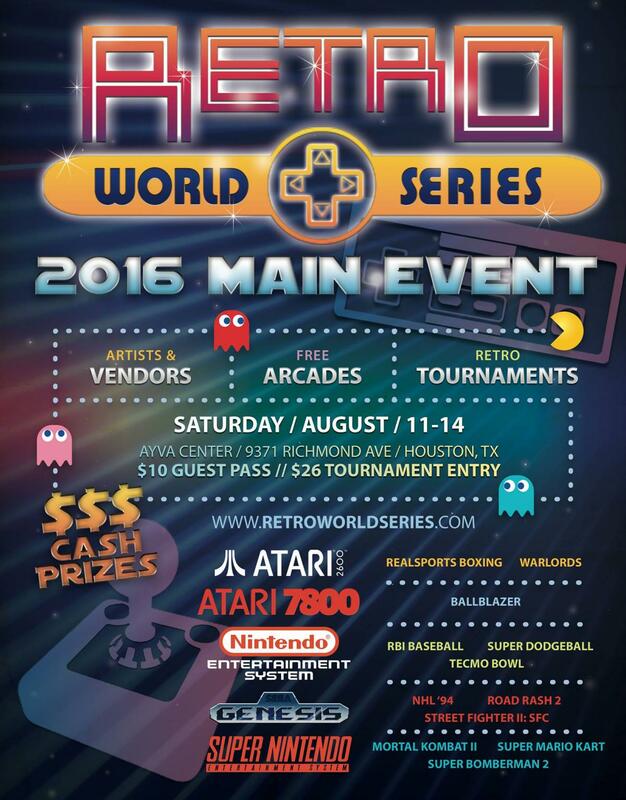 [Aug 12-14, 2016 - Houston TX] - The Retro World Series Has Launched! With NHL 94 Tournament! Just wanted to introduce myself. 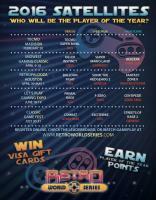 I've created a new series of events called the Retro World Series. The big Main Event at the end of the year will have an NHL '94 tournament. Feel free to contact me if you have any questions. Today, Hal Hawkins announced the first inaugural season of the Retro World Series. There will tournaments held across the country at various events as Satellite Tournament with the season finishing off at the Main Event on August 11-14 in Houston, TX (Thursday-Sunday). "I hope to create an opportunity for recreational and serious retro gamers alike to be able to take part in an event that's both fun and competitive," said Tournament Director Hawkins. "The retro gaming community has grown by leaps and bounds over the past few years, and the Retro World Series wants to give this community the ability to enjoy retro games throughout the year with a great, big finale at the end." 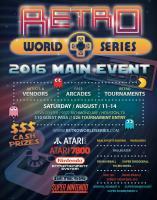 The Main Event will feature 12 versus tournaments for Atari, NES, SNES, and Sega Genesis. 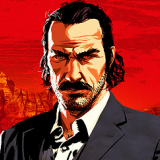 The Satellite Events will consist of high score, speed run, and versus tournaments.Players who compete in the events will earn points towards the Player of the Year award with a big cash prize awarded at the end of the Main Event to the winner. The Satellite Tournaments will be free to enter with prizes awarded to the winner and runner up. The winner also receives an entry into the Main Event tournament of their choice. Gameplay at the Satellite Tournaments will be recorded and uploaded after each event. 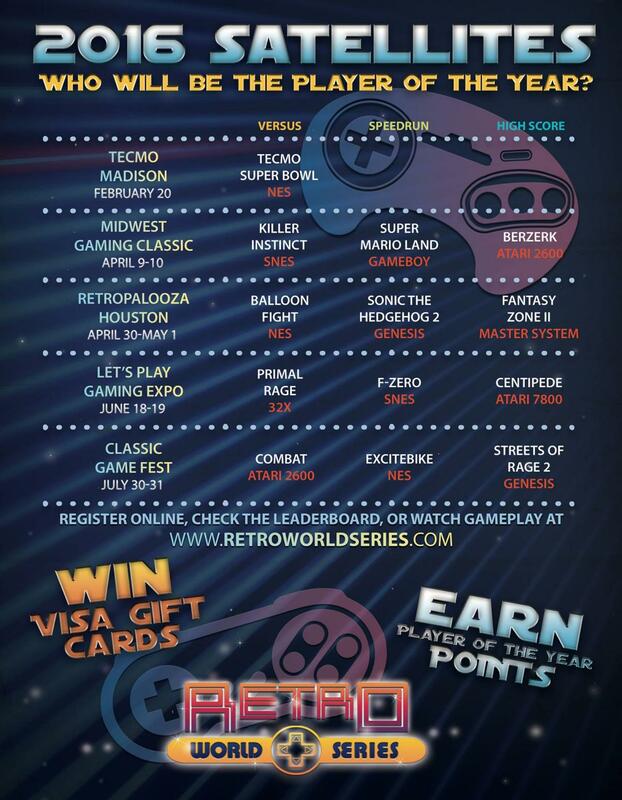 If you're an interested gamer, vendor, sponsor, or just want to come watch, visit www.retroworldseries.com to get more information and sign up. So, if I'm reading this correct, Satellite events are not required for the Main Event in Houston, but do enable you to win a free entry/extra cash prizes? Or do you need to qualify for the Main Event down in Houston? I've got a brother that lives down in the Houston 'burbs, and I'd consider a trip to visit him and catch some cool NHL '94. Not sure I'd be able to get to any of the Satellite events, especially if they aren't games I'm familiar with! Thx for inviting us either way bud. You don't have to play in the Satellites to enter the Main Event. The Satellites do allow you to win prizes, win entries, and earn points towards the POY award which has a cash prize. Real nice... Too bad the coin toss rule is there. I believe team selection should be anything-goes like in MLG, and a limit could be added for how many times a player picks a certain team. Nice! I'd rethink auto goalies to manual, because that can get brutal. I'd be down for all the Genesis events (Road Rash, SFII and '94)! I definitely get your point there. That's certainly worth considering. oh, yeah. NO WAY on the auto goalies. that is for amateurs and newcomers. LOL Can't have them all in one year. The great thing about retro gaming is there's literally hundreds of good ones to choose from, so if this is successful this year, we can keep adding new games year after year. Bad News is on the list. You should add King of '94 West to the tourney schedule. We just completed it over the weekend. We had about 30 buds there playing NHL'94 for sega and SNES. This sounds neat. So the idea is kind of that you go and play all the games (or as many as you want) and try to get the best overall score/rating? Although I guess that's $26 per game you want to play? Can you break down how the 94 tourney works? I'm guessing that, based on the 45 minute time slots on the two elimination days, the round robin narrows it down to 64, then it goes down to 8, the the final 8 play on the last day? They'd have to allow our triple elimination format, unless we want to go single elim. "The satellite tournaments will feature single elimination versus tournaments "
Although actually... I suppose the winner of the last game before the loser bracket guy comes back in is the single elimination winner, so we could actually do both at once.. In other words, the last undefeated player wins the World Series prize, and then we continue the triple elim for the King of 94 prize. Works fine! Hmm except that our team choice method is someone picks both teams, which isn't how the World Series rules are. But we're doing it the Madison Tecmo Bowl way, so I'm confused because the Madison Tecmo Bowl is a satellite event, too. The Satellites events are not restricted to a specific format. The difference between Tecmo Madison and the rest of our events is that we are partnering with Tecmo Madison to make it a Satellite event. We have no intention of changing what they do. The other events are being hosted by the RWS at various conventions in large booths we've rented. Since we are having three at each convention, and each convention is only two days long, we are restricted due to time constraints on the format we can have. Tecmo Madison is an established tournament dedicated to one game that lasts all day, so they are fully capable of having the format that best suits them. For example, if we were to partner with King of 94 to make it a Satellite event, there would be no change to its format at all. As far as the 94 tournament at the Main Event, there will be a group round robin of four players in each group. Each player in a group will play each other once. The top two in each group will advance to the single elimination bracket. The semifinals and finals (the last 4 players) will play on that Sunday when all of the semis and finals will be played. How many players are in each round robin group? Is it 8 players in each round robin group, top 2 make it? Elimination day 1 starts with 16 players, and 2 rounds are played, bringing it down to 4 players, then the last day is 2 more rounds to crown a champ? For example, if 64 people sign up for the NHL 94 tournament, then the group round would consist of 16 groups of 4 players. The top 2 in each group would move on to the single elimination bracket, so the 1st round of the elimination bracket would be Round of 32. With the coin flip, most often the winner will choose to select the team rather than home/away, but if you do win the coin flip, you do get first choice in team or to be home/away. You can't pick the same team. So if you and I played, and I won the coin flip, I'd choose to select my team first (e.g. Penguins). Then you get to choose who is home or away and then your team. advantage: coin flip loser, by far. I dunno, if you win and say you're Home, then really the other guy needs to pick DET because they are strong away, then the home guy can pick CHI, MTL, VAN... Seems like being home is a big advantage, other than the fact you're playing vs DET. No? In another thread where Raph did the math, it seemed like the home team basically has a 5% advantage. More than anything, it's just kind of a dull way of doing it because there's no variety, because the teams are not meant to be balanced. The goal is to keep it as simple as possible. We are going to be having a lot of tournaments and have a limited amount of time. We are also going to experts playing as well as novices, so we want to keep the team selection process as easy as possible. There's no perfect way, and if the coin flip doesn't satisfy enough people that actually play in the tournament, we can definitely look into adjusting the rules. There is no disadvantage for anyone as long as players are free to pick whatever team they want to. How could one guy be at a disadvantage when there are so many competitive teams to choose from? So, the coin toss winner hardly gets an advantage at best I guess, but not really. I see. winner picks home, loser picks team, winner picks team... makes sense. If I had been more prepared I would've live having the choice of teams. Just didn't put the time in to come up with match ups I'd be comfortable with. Regardless of format, if anyone from the online community makes it to Houston they should sweep the '94 tourney. Btw, my worst loss in Toronto was when KG gave me Detroit (don't remember which team he had atm)...lost like 9-1. Brutal. Yes, no worries . There's no real problem with it. I'd go depending on my Fall Sports pre-season which I should know soon. That is pushing right up against it, but I would love to play TSB also. Northwest Territories in July and Texas in August. Yeah, I'm tempted too, and if we have some '94 guys, the downtime could be used up just playing exis! Will be a lot to ask this year...figure NWT a possibility in July, I assume KO94-2 will be in Sept in Toronto...this in Houston. I believe it was Detroit-Buffalo. Yes! Good memory, I just reread it on my KO94 diary. 8-1!